LOMBARD, IL — A new plan for the revitalization of downtown Lombard centers around the historic DuPage Theatre, according to the Daily Herald. The 1928 movie house, which has been the focus of some debate in the Chicago suburb is expected to cost between $8 and $8.5 million to restore. 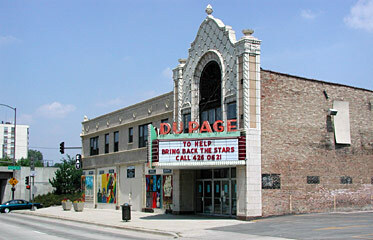 The new proposal just released by the DuPage Theatre Foundation (to be presented to the village board on April 7th) is a $32 million plan which involves luxury condos and lofts being constructed in and around the former movie house, along with retail shops and a restaurant on the first floor (along with a small theater space, perhaps). The condos and lofts built above existing storefront spaces in the theater building replace an earlier plan by the Foundation to create studio and classroom areas in that space. Twelve condos would be constructed behind the DuPage and a five-story new structure housing 68 condos would be built on a parcel of land directly south of the theater. The new building facades would be covered with terra-cotta to match the existing building. Plans also include 248 parking spaces, some underground, which would in part be used by Metra commuters.